Having a repertoire of easy chicken recipes you can make on a moment's notice (and in many cases without a recipe) is one of the easiest ways to save time in the kitchen. 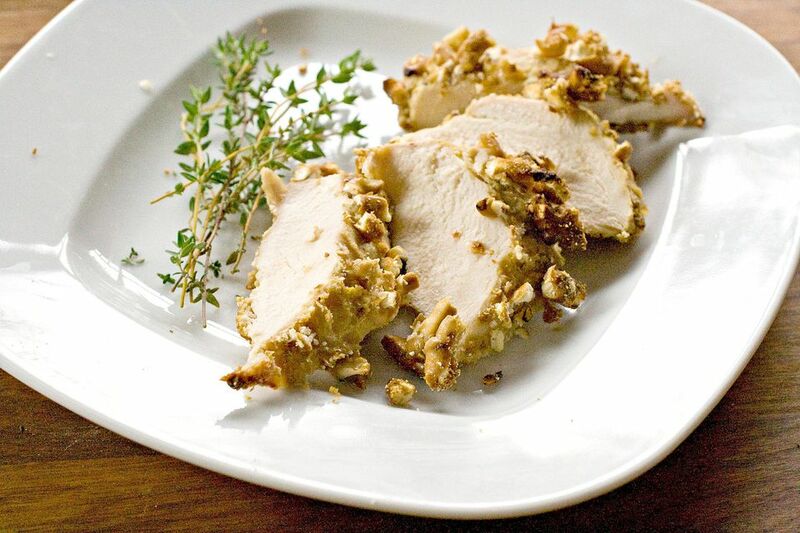 Boneless, skinless chicken breasts (or thighs) are wonderful coated with everything from grated cheese to breadcrumbs to chopped nuts to pretzels. Finely crushed pretzels make an automatically super crunchy coating for boneless, skinless chicken breasts in this easy recipe. Choose your favorite type of pretzel for this coating. Because the pretzels usually have so much salt (unless you choose a salt free variety) this recipe doesn't need more salt. If you use pretzels that don't have salt, sprinkle the chicken with some salt before coating. Serve this recipe with a green salad tossed with avocados, sliced mushrooms, and grape tomatoes with a honey mustard dressing to complement the flavors of the chicken. Add some baby carrots and a nice glass of white wine for a wonderful dinner. Combine the butter, horseradish or mustard, and hot pepper sauce in a shallow pan and mix well with a fork to combine. Mix the crushed pretzels, flour and parsley in another shallow pan or dish with your fingers. Dip the boneless, skinless chicken breasts into the butter mixture one at a time, then roll the coated chicken pieces in the crushed pretzel mixture to coat. Put the coated chicken on a wire rack inside a shallow baking pan. Bake at 400°F for 18 to 24 minutes or until a meat thermometer registers 165°F. Let the chicken stand for five minutes, then serve.